As appears in an article published on Oct. 31st by the Daily Bulletin. For many, street vending is one of the few options available to make a living to support themselves and their families. Though ubiquitous throughout Southern California, the work of street vendors has often been subject to strict and even sometimes draconian rules, restrictions and punishments. Despite there being as many as 50,000 vendors in the city of Los Angeles, the second-largest city in the country, was the last major city to finally remove criminal penalties for sidewalk vending this year. 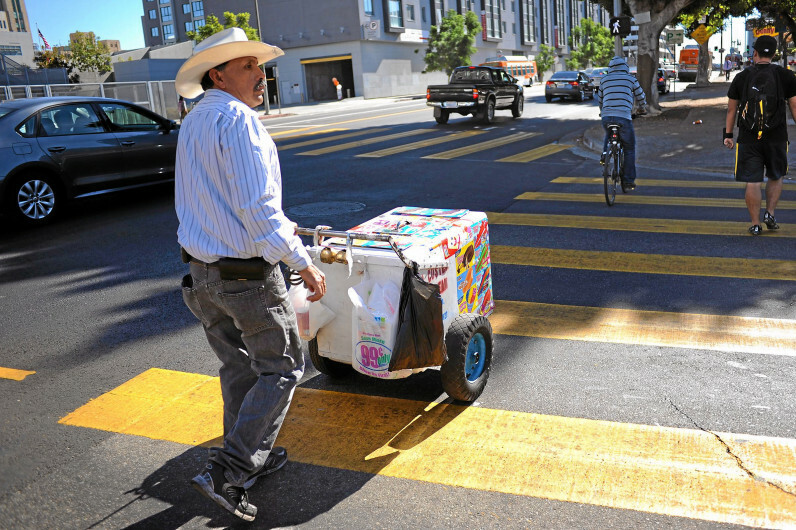 In February, prompted mostly by the election of President Trump and fears that criminalizing sidewalk vendors would put many undocumented immigrants at risk of deportation, the City Council unanimously voted to remove criminal penalties for sidewalk vending. Whatever the motives of the council, the removal of criminal penalties was ultimately a good thing, for criminalizing a market that according to the Economic Roundtable generates upward of $500 million in business a year has always seemed like a misguided waste of resources and opportunity. However, there is still work to do. The city has yet to make much progress in developing and implementing a framework to legalize the work of street vendors, and criminal penalties remain in place for vending in city parks. Councilmen Jose Huizar and Mitch O’Farrell have proposed removing criminal penalties for vending in city parks. We urge the council to do so and focus greater attention on providing vendors greater opportunities to work legally. The consequences of continuing to criminalize any aspect of street vending often do little more than make a mockery of justice and the rule of law. Take for example the case of Marcelina Rios of Ontario, who was arrested last month at Old Town Park on Oct. 13 for selling corn without having the proper paperwork. Booked into the West Valley Detention Center, Rios was then taken in by ICE agents, who transferred her to the Santa Ana City Jail and then the Adelanto Detention Facility. This is an excessive response to someone trying to earn a living and an abuse of the justice system. We call on all cities to remove the threat of criminal punishment from vendors and instead work to make lawful vending easier.